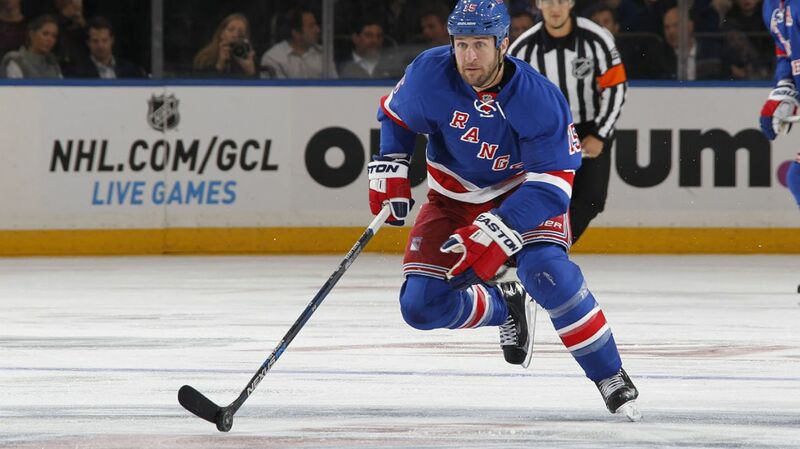 Last year, I would have given anything to get Tanner Glass out of the Rangers lineup. For almost the entire year, he was ineffective, contributed little to the game and was more of a detriment than anything. Today, I would actually advocate for him staying in the lineup as an everyday player. Currently, it seems like the fans opinion on Tanner Glass is mixed. Some people really appreciate his grit and toughness in the lineup. Other people believe that he still isn’t contributing much to the lineup and would be better off in the press box. When Glass played his first two games this season, it seemed like nothing had changed. He was still bad with and without the puck, he didn’t join the attack, and all he really did was hit people. So the Rangers sent him down to the AHL for some cap relief and more playtime for the veteran forward. The coaching staff at Hartford has done an excellent job of working with the team’s young prospects and getting them NHL ready, namely Oscar Lindberg, Dylan McIlrath, JT Miller and Jesper Fast. But they also did an excellent job teaching an old dog new tricks. Since Glass’ AHL seasoning, he has turned into a much better, more versatile player. Fans of the rangers AHL affiliate said that he took his trip to Hartford seriously, working hard and mentoring some of the younger players. In 17 games, he scored two goals and had three assists and was a -11, although that was also a product of the team’s struggles. Last year he was a possession black hole, but now he actually has the best corsi for percentage (46.71) out of all of the current fourth liners. He’s still the same aggressive, tough and rugged forward that Vigneault likes, but he’s been effective in other areas as well. Part of the reason for his success is the fact that he is placing an emphasis on holding onto the puck and maintaining possession. That’s been evident in his style of play. Last season, Glass was almost always hanging along the boards, rarely joining the rush and hardly getting involved in the attack. But if you watch him now, he’s been a lot more aggressive on the forecheck, like he said, and it’s improved his possession numbers. He’s also in front of the net setting screens and causing a distraction. And I think he’s had more high-quality chances this season than all of last year. He’s also been using his physicality to create possession. On Dominic Moore’s winning goal in Tampa, Glass hit Anton Stralman behind the net, on the forecheck, and forced a turnover. Viktor Stalberg found Dominic Moore and he beat Bishop for the game winner. It was a perfect example of everything that Glass can bring to the lineup. Glass would finish that game with a 55 CF%, a career high +3 and four hits in five-on-five situations. While he will certainly have some of his bad possession, ineffective games reminiscent of last season, there will be much more positive games then there will be negative. Tanner Glass is no longer a detriment to the Rangers lineup, he’s turning into a pretty important and efficient player. Posted on January 4, 2016, in In the Crease and tagged Alain Vigneault, Dominic Moore, Jesper Fast, Madison Square Garden, MSG, New York Rangers, NYR, Rangers, Rangers fourth line, Tanner Glass, Viktor Stalberg. Bookmark the permalink. Leave a comment.